Shop Mono M80VAD Vertigo Acoustic Dreadnought Guitar Case Black from AMS with 0% Interest Payment Plans and Free Shipping. After talking with musicians and doing research, Mono Cases developed the top-loading case to save space, time and musician's backs. In addition, Mono went ahead and redesigned the Headlock for automatic neck support. Then Mono created The Boot, a rubber sole designed for unsurpassed protection against vertical drops. The game has changed. Hybrid case design with ABS head and body impact panels. Water-resistant Sharkskin shell with industrial rubber sole and piping. The Boot (patents pending) custom molded rubber outsole. Dimensions: 42" x 16" x 4.5"
Combining manufacturing methods from military, footwear and extreme outdoor industries, the Vertigo™ represents not only superior guitar protection, but a technological advancement in luggage design. The award-winning Top-Loading™ design of the Vertigo allows for easy access to the guitar while in a standing position (patents pending). 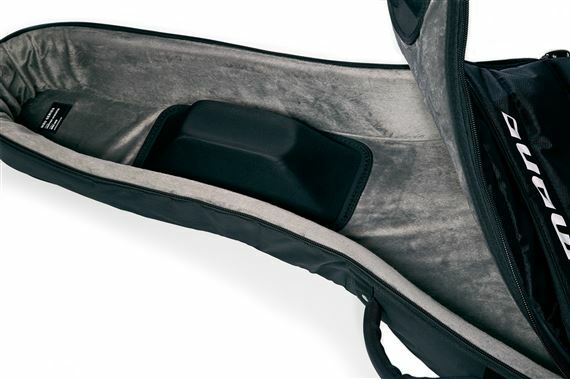 The Boot™ on the bottom uses sneaker technology to protect the guitar against vertical drops. The automatic Headlock™ grips the guitar inside suspending the headstock and neck during transit. The Vertigo is light, fast, sleek and rugged. Thanks to some serious design, traveling with a guitar has never been this fun. A slick feature that you will come to love: the Vertigo does not open like a traditional guitar case. 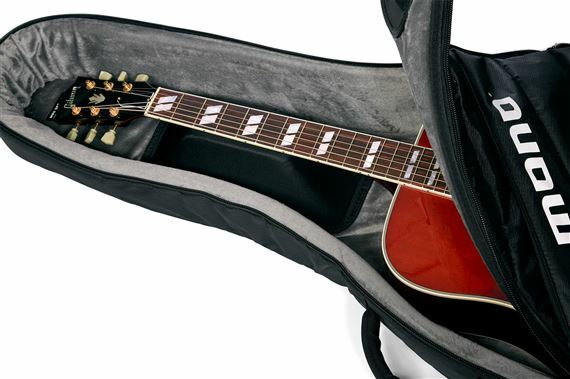 Its design allows you to quickly unzip the case and pull your guitar out from the top. This is enabled by a hidden diagonal hinge on the front panel of the case. Once unzipped, the case naturally opens out and to the right. No need to lay your guitar case down on the floor. Stop bending over. Nobody wants to see that. Take a stand! These measurements represent the inner capacity of the case. If you are unsure about the fit for your guitar, make sure it does not exceed any of the maximum dimensions shown just to be safe. This case is designed to fit all standard body acoustic dreadnought guitars including Martin, Taylor, Yamaha, Gibson and others. Also suitable for most archtops. Please check with support if you have any questions about fitting. This is a solidly-built gigbag fr people who demand a lot of their equipment. If you just need something for home-to-rehearsal, save your money. I bought it for the vertical load-unload, as I remove my guitar many times a day, in crowded settings. I also need something very sturdy: even $200.00 bags only last a few years for me. The vertical idea works, but is only modestly easier than just doing the vertical thing with a regular gigbag. Drop-proof padding under the lower bout of the instrument is, however, outstanding. The longevity of both the shell and the lining remain to be seen. I was glad to find that there is more storage space than I'd expected. All in all it's well worth it, if you need the vertical load combined with excellent build quality.